Tim bought my first mother’s ring for me the Christmas after we said goodbye to our only daughters, Faith and Grace. I wanted a piece of jewelry that signified all my children: Timothy and our girls…a January and two Novembers. I couldn’t speak. I shook my head no, and turned as the tears spilled from my eyes, running from the store. Ginny stayed and told her about our Thomas, who was born in July and lived on this earth for six hours. We would need a ruby added to my ring. The girl’s faced turned pale and she apologized profusely. I never thought there would be a fifth stone to add. an unexpected miracle brought me back to the jewelry store. It was time to add a May stone for the miracle that stayed and filled our house with his zest for life…sweet baby James. This time, my friend no longer worked at the store and the people behind the counter said they couldn’t add a stone to my ring. It was bent a little and thin from being worn. I began to tell them the story. I didn’t expect tears that day, but the tears came when they said all they could do was offer me another ring…one that cost more than twice as much as the one I had. So, for several years, there was no ring complete with the birthstones of my children. Then, finally on a special occasion I can’t remember, Tim and I replaced the ring on a shopping trip. Only, I lost it a few months later before a golf event. More years passed…and I lamented over the ring that wasn’t. My mother went home to heaven, joining her grandbabies and leaving her mother’s ring to her only daughter. I have been considering for the past four years putting my babies’ birthstones on my mom’s mother’s ring. But, there always seems to be another expense or more pressing need. Recently, though, my engagement ring broke and I needed some other work done at the jeweler. So, I chose a local store called the Diamond and Gold Outlet. You can bring them your old, broken, used gold pieces you don’t want and they will count the value toward your purchase. So, I had them put the stones representing my five children: (two on earth, three in heaven) on my mother’s mother’s ring, making it my own. Not only does the ring represent my children, but also my mother. I feel so blessed to have this precious, perfect gift on my finger representing those most dear to me. And, an added blessing: The total cost with all the work I was getting done, including a new wedding ring, was going to be $273. With my gold jewelry trade-in, it only cost me: $18 !!! I tried to take a picture, but my camera is not great and the flash lit up the ring too much. So, it’s hard to see what it looks like. 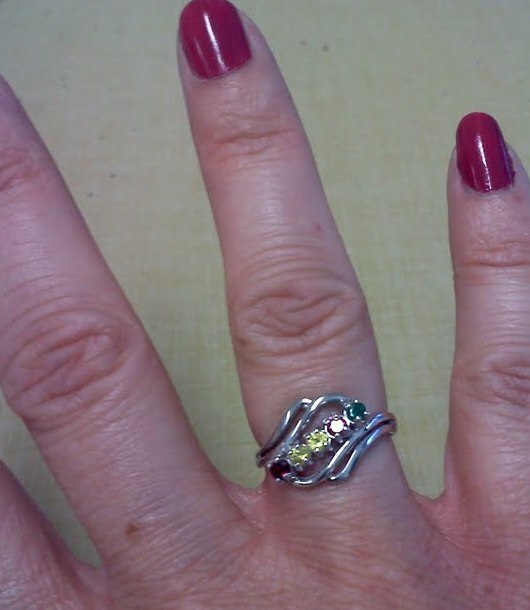 The important thing is that it’s on my finger, complete with five precious stones, representing five precious lives. I love it…and I’m so grateful. 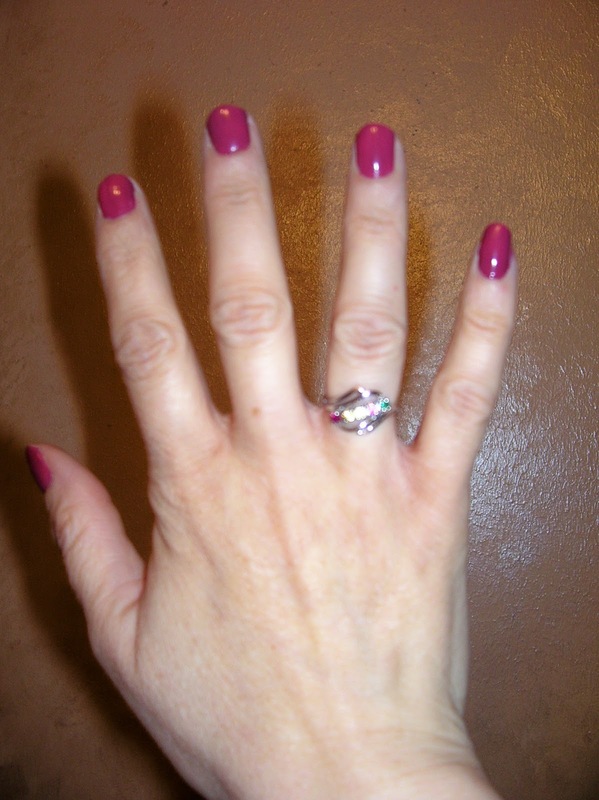 O.K….so a couple people have asked me about my wedding ring. I had a small diamond solitaire on a thin gold band that Tim gave me when he was just seventeen (the current age of our son…YIKES!). It was modest, but special because he gave it to me. I tend to wear more silver jewelry (or white gold), but I didn’t give a lot of thought to ever changing the rings. They were the ones he gave me when we were married, and I don’t require a lot of fanciness. Besides, a big old ring would just get in my way! But when my engagement ring broke recently, I gave some thought to my mother’s white gold engagement ring that she had left to me when she passed. I thought if I was going to have to invest in fixing my ring anyway, maybe I would just wear her ring, and get a white gold band to match. 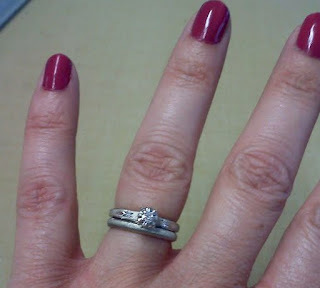 I’m a sentimental gal, so I wasn’t sure how I felt about wearing a wedding set that wasn’t from Tim. But, after talking to him, I felt better. It’s just stuff, after all. A ring doesn’t make a marriage…that’s for sure! And, he was happy for me to have something pretty and new. I chose a white gold wedding band, and the jeweler put a finish on it to match mom’s engagement ring. What did I do with the diamond Tim had given me when he asked me to marry him? Both pieces are very special to me…and they encompass all of the people on this earth (and some in heaven) that mean the most to me: Tim, my children, and my mother. What precious, simple gifts. They are just right. Like my mother, I’d much rather have something that’s precious to me than something fancy and expensive. Treasures in heaven are the ones that matter most, but I’m sure grateful for these sweet reminders on earth as well. Congratulations on your new ring Kelly. It is beautiful, and I'm sure you feel so complete right now. And what a wonderful way to keep your mother's memory close by. Jewelry that has a story and a journey is the most meaningful and special. What a beautiful ring – and what beautiful lives it represents! It is a beautiful ring Kelly! thanks for showing us a picture! Absolutely beautiful, Kelly…..the ring and the story of how God worked it out so that you would be able to do it for a great price. I am like that too…..those sentimental things mean so much to me, so much! Awww so pretty Kelly! I know it is very special to you! I am so happy for you. the new pictures are great! Your rings are gorgeous and I'm sure are so incredibly meaningful for you. You'll always cherish them. I found myself sitting here crying. What a story. So happy how it all turned out. The rings are beautiful. I like white gold too but my wedding band is gold so I mix them also. Il y a des cadeaux qui sont inestimables (pas du point de vue fiancier, mais parce qu'ils ne sont pas remplacables par l'histoire qu'ils racontent). What lovely new (old) pieces for you to have and cherish.